Smart ForTwo Cabrio Review 2019 | What Car? 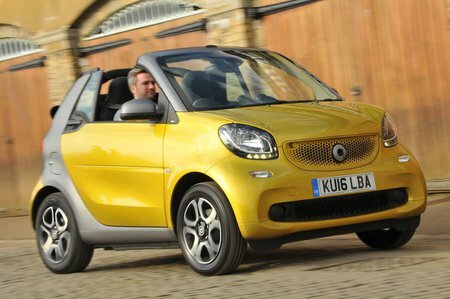 Not many cars can claim to be truly unique these days, but the Smart Fortwo Cabrio is probably one of the few that can. Its two-seat, city car body is under 2.7 metres long, and it’s really unlike anything else on the road. In this open-top cabrio form it’s a niche even further, and, as such, it’s difficult to judge against direct competition. The closest options are cars such as Fiat’s 500C, and open-top versions of the Peugoet 108, Citroen C1 and Toyota Aygo. Around town, few cars can match the Fortwo’s agility. Its light, quick steering and tiny dimensions make it perfectly suited to nipping in and out of traffic while its tiny turning circle makes light work of tight streets and parking. However, outside the city, the quick steering and short wheelbase make it feel nervous in bends, and the Cabrio suffers from a generally poor ride. Refinement is pretty average, too. There’s generous space inside for two, while the cabin has too many cheap feeling plastics and borrowed Renault switchgear to justify the Fortwo’s comparatively high prices. Ultimately, the Cabrio does a brilliant job in town, but its cheaper rivals offer more seats, more comfort, more quality and a better drive, making it difficult to recommend the Smart.